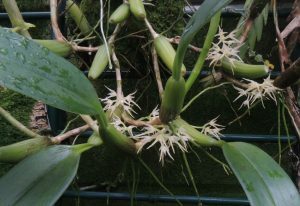 This Bulbophyllum species from South East Asia and Assam produces quite small flowers from the base of pseudobulbs but does so in profusion and so gives a lovely display. It is reported to grow as a lithophyte in moss from 500-800m altitude in warm forest but we find that it is not fussy about temperature and grows happily in Warm Asia (min 18C, Cool Asia (min 10C) or Cool Americas (min 12C) but it does seem fussy about light preferring to grow in shade and with plenty of water reflecting its microhabitat. We grow the species in pots and, even better, mounted as it does tend to straggle out of its pots and root in surrounding pots.